Risk. Danger. Heights. All in a Day’s Work. This is a story about brotherhood and the ties that bind. These dauntless bridge painters may not be related by blood, but they’re brothers nonetheless, working side by side to save massive structures from decay. Risk and danger define their 12-hour days as they sandblast through layers of hazardous coatings and destructive corrosion, operating at dizzying heights. In this feature-length documentary, the crew works together to preserve two of Philadelphia’s most important bridges, racing against the clock under the exacting eye of their foreman and company bosses. These guys manage to tackle their jobs with grit and a wild sense of humor while battling Mother Nature and, sometimes, each other. 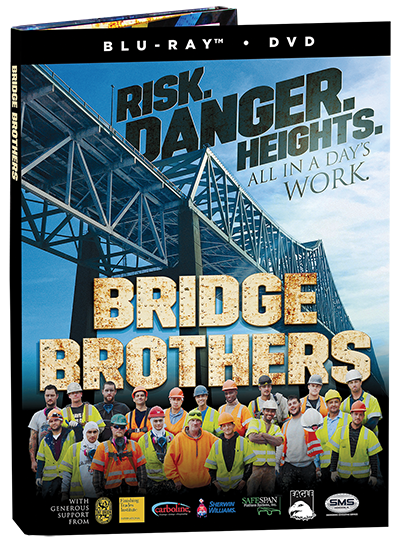 The Bridge Brothers package contains a Blu-Ray disc, a standard DVD and a 24-page booklet filled with beautiful photos of the bridge painters and their stunning iron canvas.